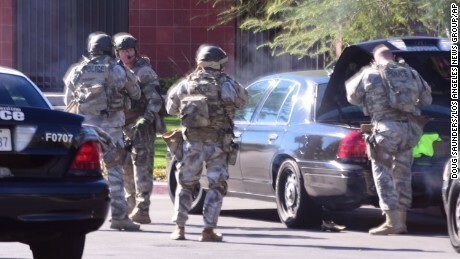 “There are multiple casualties and confirmed fatalities,” San Bernardino Police spokeswoman Sgt. Vicki Cervantes told reporters. One thing that can be predicted to come out of all this is expanded concealed carry laws. Basically, the population is about to demand of its lawmakers that it be allowed to defend itself. The police cannot be everywhere. And the best way to stop one of these situations will often be to have someone close by to help. And many are willing to be that person. I’m one of them. But we can’t do that because we can’t carry in public in our states. I’m in the Bay Area, so it’s extremely restrictive here. But this will change soon. Maybe not in the Bay Area, but in many places in the U.S. The people will only take being helpless for so long before they interpret the 2nd Amendment to mean that they’re allowed to protect their families and their communities by carrying in public. In a safe world, I disagree with this. But we don’t live in that world anymore. We’ve bent our society to the maximum, and now the cracks are showing. Watch and see. The calls for responsible concealed carry laws are on the way.